While Tiny continues to offer its free open-source editor, it offers a cloud-hosted version of its service with a fee based on the number of users for developers who want the company to handle the backend infrastructure, as well as a self-hosted version that Tiny charges for based on the number of servers it runs on. Roberts noted that quite a few developers try to build their own text editors. Yet handling all the edge cases and ensuring compatibility is actually quite hard. He estimates that it would take two or three years to build a new text editor from the ground up. As part of today’s announcement, Tiny is also launching a number of new products. The most important of those from a business perspective is surely Tiny Drive, a file storage service that developers can integrate with the TinyMCE editor. Tiny Drive offers all of the file storage features that one would expect, including the ability to handle images and other assets. Tiny Drive uses AWS’s S3 file storage service and CloudFront CDN to distribute files. Also new is the Tiny App Directory, which Roberts likened to the Slack App Directory. The idea here is to offer a curated list of TinyMCE plugins. For now, there is no revenue sharing here or any other advanced features, but it’s definitely a play for creating a larger ecosystem around the editor. Tiny also today announced the first developer preview of the TinyMCE 5 editor. The updated editor features a new user interface that gives the editor a more modern look. 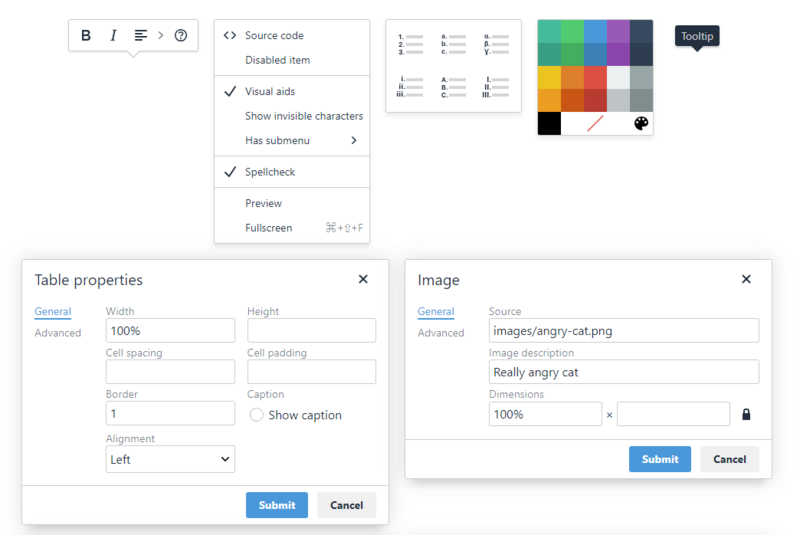 Developers can customize it to their hearts’ content, with plenty of compatible plugins and advanced features to extend the editor based on their specific needs. There’s also now an emoticon plugin.